SELECT Sport selger tre millioner baller hvert år. 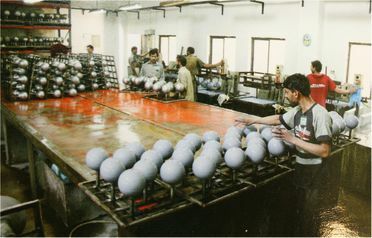 Omtrent 90% av disse er håndsydde fotballer eller håndballer produsert i Sialkot område av Pakistan av Anwar Khawaja Industries (AKI). SELECT er en av mer enn 70 utenlandske selskaper med produksjon i Sialkot, hvor omtrent 70% av verdens håndsydde baller er gjort. Flertallet av de tusenvis av mennesker som sy baller i Sialkot, virker ikke direkte for ballselskaper, men et bredt nettverk av leverandører og deres underleverandører. Disse arbeiderne får ikke en fast lønn, men får betaling for hver ball som de gjør. 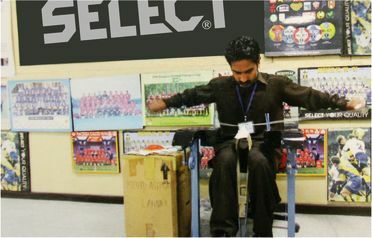 Like other companies, SELECT pays the market price for the stitching of their balls in Pakistan. But it is our conviction that our responsibility goes further than this. 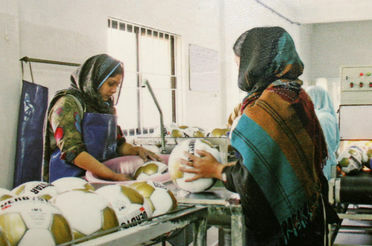 For those people who stitch SELECT balls in Pakistan, it is our aim to meet their basic needs. These needs include medical assistance and medication for the whole family. All children are given the opportunity to have an education. Education is the key to improving living standards for future generations. This objective also includes abolishing child labour, something which SELECT and AKI do not wish to make use of. To ensure that these objectives are achieved, SELECT and AKI have produced an assistance programme for their workers known as SAHEP (SELECT Anwar Khawaja Industries Health & Education Program). SAHEP’s services include providing free comprehensive medical assistance and medication for all the members of workers’ families, incentives to keep children at school and direct schooling for children who cannot attend general school.SAHEP staff in Pakistan, under the management of Mrs. Anita Khawaja, keep accurate records on all of SELECT/AKI’s workers and their children, visiting the families on a regular basis. This ensures that SAHEP’s services benefit the right people and that each family's needs are being met. “We are very grateful to the SAHEP programme which meets our needs and is adapted to the taboos we have here. My sister Shabana and I would not have learnt to read and write if the programme had not existed", says Naseem, a SAHEP pupil.In order to encourage families to educate their children instead of sending them out to work, SAHEP gives the family a sum of money for each child going to school. This money covers the cost of school books, a pair of shoes, a uniform and a sweater, things that children need to be able to attend the local primary school. Teenagers and adults who continue beyond basic schooling also receive financial support.SAHEP also provides local education for children who cannot go to general school because they have already been taken out of the school, they are disabled or for other reasons. The programme covers the expenses for our teachers who visit small groups of pupils six days a week for two hours at a time, provides teachers with motor bikes and basic teaching resources and gives pupils school books and other materials in a hard-wearing metal box. We also arrange special summer courses and afternoon lessons, which includes extra tuition for children who need help with their schoolwork in the state school. There is very little social welfare provision in Pakistan, which means that a serious illness can easily wipe out a family’s finances. 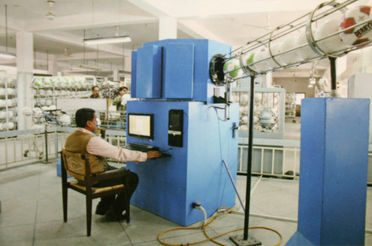 As a result, SAHEP was adapted to include free medication and medical assistance for all workers and their family members. The SAHEP families are given a medical card and a list of local hospitals, doctors and specialists included in the programme. The bills are sent directly to SAHEP’s office. Around 7.285 people now have a SAHEP medical card. SAHEP also hires a mobile healthcare team to provide health care locally. This includes a nurse, midwife and a trainer, and sometimes a specialist. The healthcare team goes out to the villages once a week and carries out health checks, baby checks and vaccinations, provides information on family planning, nutrition and hygiene and distributes medicines.